Sorry I had not been able to send the photo of the chair covers from my ceremony, but I will definitely scan the photos tonight and send it to your email address. I did however attach a picture of myself and new husband. Everything turned out beautiful and the chair covers were a big hit. 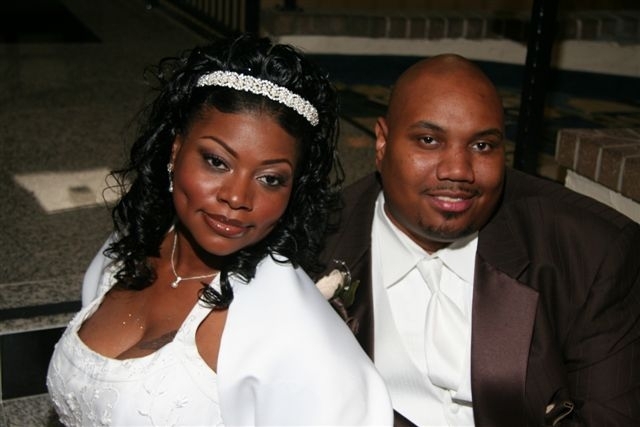 Thanks again for allowing us to use your product in our wedding. I just want to say THANK YOU for the superb service!! I already received the black sashes. Between those and the white chair covers, you have saved me a lot of money! You guys are the best! Thanks for calling me. the chair covers and the sashes were great. They were a perfect fit for the chairs. I sent you back the box yesterday, i hope you get it on time. Thanks for all you help. By the way, can you please send me your catalog or business card. I am finally back from my honeymoon, and wanted to drop you a line to let you know that we absolutely loved the chaircovers! My sister-in-law told me you called to check. Since I didn't mail them back myself, I also wanted to see if they arrived back alright, and if everything looked ok. I'm still waiting on our wedding photos, but will try to send you a shot of the room if there is a good one. Everyone was quite impressed with how the chairs looked. By the way, the three that we ordered looked beautiful! We've actually used them twice; I'm impressed with how well they washed (even gravy stains came out) and how wrinkle free they came out of the dryer. I'll give you a great recommendation any time! I don't know how to say thank you enough for the beautiful tableclothes. DHL brought them on Friday morning and we were able to use them for the wedding reception that evening. They are absolutely gorgeous. I hadn't expected such quality! You really made my son's wedding day special. Thank you again - a thousand times! I'm in Jamaica right now! The chair covers and sashes were awesome. I would just like to say to anyone having second thoughts about using the services of Hook my Wedding Up just do it. We looked all around and the cheapest cover/sash we could find was $8.00 until my husband found this website. It was alot of work being the mother of the bride but well worth in the end not to mention we saved alot of money. So my hat goes off to this company. 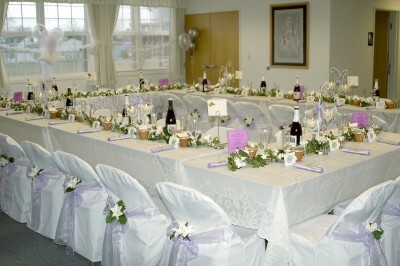 The chair covers and sashes made all the difference in the look of the banquet room. They were shipped without any problem, I was so happy with the results. Thanks so much for the chair covers. They were well taken care of, inexpensive and they arrived well in advance. We received so many compliments at my daughters wedding. They really added the finishing touch to the room. The only hard part about the whole process, was getting them back in the box they arrived in, but we did! Thank you for the beautiful chair covers! We loved them. They arrived on time, clean, and well cared for. They really made our ballroom shine! We got tons of compliments and requests about where we got them. Plus, your prices were the best around! Thank you so much! I'm so sorry I let so much time pass before I contacted you, but my wedding in October was gorgeous.. people are still talking about how beautiful the room looked. The satin tableclothes and chair covers with the burnt orange sashes we just perfect. I'll send a photo. Everything went so smoothly, I would definitely recommend your services to anyone I know who is having a special occasion. Thanks again for everything and hope you had a great day on the 18th as well! Thanks so much for all you do for my brides!! I tell everyone that I meet with about your chair covers. The pricing can't be beat and neither can the service. I'll certainly keep sending my brides to your website. Hi Kim! Again your exerpertise made our Party, you matched the color to a "T". Thanks once more and we will keep using your Wonderfull Site. Hi Kim, Just to thank you for recomend me the satin chair covers, they look so elegant they really made the party! my daugther was so happy and our guests love it as well, you are great!!! This is Odessa & Demarkeus Smith. We just wanted to let you know that your chair covers were a big hit at our wedding. Everyone loved them, we got so much good comments. Thank you for all your help, you are a good business owner. I wish you much success with your business. I AM LOOKING FORWARD TO USING YOU SOON . LOVE WHAT I SAW. I wanted to thank you for the quality tablecloths, they were the exact match! You are such a pleasure to work with. You went over an beyond to get my order to me in a timely manner. I will continue to do business with you. I will not hesitate and it would be a pleasure to give your company referrals!